By Skowno A, Thompson M, Hiestermann J, Ripley B, West A G, Bond W.
Woody plant encroachment in South Africa’s savanna-grasslands has been considered a rangeland management problem since the early 1900s. This phenomenon, which has been observed globally, is particularly important in Africa given the extent of tropical grassy biomes on the continent and their importance for rural livelihoods. In the study, local and regional scale approaches were used to investigate woody cover change in South Africa across the important savanna-grassland rainfall threshold of 650 mm mean annual precipitation (MAP). The aim was to test this threshold using remote sensing and demographic surveys in order to better understand the patterns, mechanisms and drivers of encroachment. Rates of encroachment and population demographics of Vachelia karroo were compared at arid and mesic savanna sites in the Eastern Cape, using time-series analysis of historical aerial photographs in conjunction with field surveys. Changes in the extent of woodland vs. grassland were then quantified at a national scale (1990–2013) by combining optical and synthetic aperture radar remote sensing data. 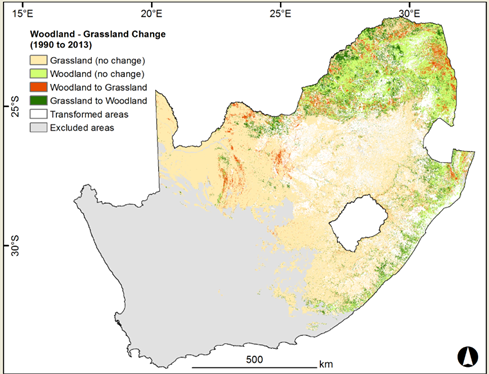 This produced the first map of woodland-grassland shifts for South Africa and provided the basis for a spatially explicit investigation of the key drivers of change. The local studies revealed higher rates of encroachment at mesic sites than at arid sites, with a correlation between drought and rate of encroachment at the arid site. Vachelia karroo seedlings and stunted saplings were more prevalent at mesic sites than at arid sites and the growth form of adult trees differed significantly between sites.